ISLAMABAD/AMSTERDAM (ANS—Nov. 8, 2018) The lawyer who helped free a Christian woman sentenced to death for blasphemy in Pakistan has received “temporary shelter” in The Netherlands, the Dutch foreign minister confirmed Thursday, November 8. Saif-ul-Malook left Pakistan on Saturday, November 3, and arrived at Amsterdam Airport Schiphol just days after his client Asia Bibi had been acquitted of blasphemy against Islam following eight years on death row. “We offer Mr. Malook from Pakistan a place in the Shelter City program in the Netherlands for human rights defenders at risk,” said Dutch Foreign Minister Stef Blok in a statement. 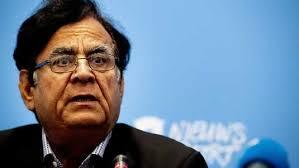 “The situation of Asia Bibi has our full attention,” he added on social networking site Twitter. The Dutch Ministry of Foreign Affairs said Malook could stay for up to three months in The Netherlands. It was unclear what would happen after that period with the lawyer who says he faces death threats at home. Earlier reports suggested that Bibi and her family were also on the way to The Netherlands. Pakistan’s government later denied that the Christian woman had left the country, but added that she was in “a safe location”. Bibi was released from prison Wednesday, November 7, in the city of Multan, after she was acquitted of blasphemy against Islam following eight years on death row. Dutch officials declined to confirm or deny reports that she had been met by a Dutch ambassador to help prepare her imminent departure from Pakistan. The decision by Dutch Minister Blok to intervene came was welcome news for Dutch Christian foundation ‘Hulp Vervolgde Christenen’ (Help Persecuted Christians), which was involved in the case. The foundation had asked for assistance saying it lacked resources to pay much longer for the security and accommodation of Bibi’s lawyer in The Netherlands. However, in controversial remarks, a Foreign Affairs spokesperson told media that the arrangement does not include providing security to the lawyer. Malook’s client Asia Bibi, a farm worker, was convicted of blasphemy in 2010. The verdict came after she reportedly told Muslim colleagues that Jesus Christ is alive and attempted to drink from the same well as other workers. Besides “insulting Prophet Muhammad” the mother-of-five accused “of contaminating” the well by Muslims. It prompted her detention and death sentence, which was finally overturned by a court last week. However, rampaging Muslim mobs have demanded her execution. Her situation has underscored broader concerns about notorious blasphemy laws in Pakistan, a heavily Muslim nation where Christians comprise just roughly three percent of the 205-million population. At least 65 people, including lawyers, defendants, and judges, have been murdered in violence associated with blasphemy allegations since 1990, according to figures from a Center for Research and Security Studies report and local media. Even if Bibi arrived in The Netherlands it remains unclear where she will eventually settle. Her husband has appealed for help from leaders of the United States, Britain, and Canada, countries which have large Pakistani communities. Wilson Chowdhry, who leads the British Pakistani Christian Association told BosNewsLife, a news partner of ASSIST News Service, that asylum must extend to Bibi’s family and other supporters. That also includes the family of Joseph Nadeem “their longtime guardian,” he said. “Timely asylum is desperately needed not only for the family of Asia Bibi but many others who could still suffer extra-judicial killing or prosecution by the state for blasphemy allegations,” Chowdhry stressed.